This year, I participated in #AcWriMo (an effort initiated by Dr. Charlotte Frost to encourage academics to focus almost solely on writing, I assume with the intent that their productivity goes up). I even joined the Google Documents’ AcWriMo Accountability Database so that I could track my progress. I was quickly derailed in reporting back on my progress simply because I had so much writing to do. So, now that #AcWriMo is over, here are my quick notes on what I learned and a summary of my progress. I must admit that I love doing these posts on what I have learned because I then have a permanent record to revisit. I will come back to this post and check what worked for me on a regular basis. - Wrote a first draft of 6 journal articles (all in English). Still rough, but thy are there. - Polished 2 journal articles’ drafts (all in English) to the point where they are almost working papers. - Edited (with a former student of mine) one journal article to the point where it’s almost ready for submission to the journal. - Re-wrote 3 chapters of my single-authored book on sanitation. - Edited a first draft of a journal article in Spanish that I am submitting this month with another professor from CIDE Region Centro. - Wrote abstracts for 4 conferences for 2013. - Created a master overview of my waste pickers project. - Prepared a survey and literature review on water conflict at the local level. - Performed a literature review on social science research methods. - Read a PhD dissertation (I’m an external examiner) and provided detailed feedback for the student and PhD advisor. - Presented 1 draft paper at a seminar in Mexico City. 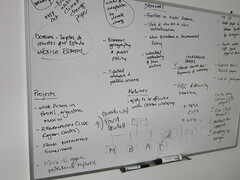 - Prepared 5 lists of books (with the help of my research assistants) for CIDE Region Centro’s library to purchase. - Participated in 3 scholarly events not related to my discipline, but organized by CIDE Region Centro. - Gave 2 entirely different talks at 2 conferences. - Wrote my Research Plan 2013, my Research Trajectory 2013-2016, and my Productivity Report 2012. - Reviewed a book proposal for a publisher. - Reviewed 15 paper proposals and 3 panel proposals for a conference. - Organized 3 social activities at CIDE Region Centro. - Gave 2 interviews to media (1 to a newspaper, 1 on TV). - Wrote 2 blog posts on my research blog. - Edited 1 press release on my research to go to media. - Wrote 5 letters of reference for several former undergraduate students. Overall, against what people might think (that November is a slow month), mine was quite hectic. I did learn a lot from trying to do AcWriMo the right way, so here are some lessons for myself and for anyone who wants to do AcWriMo. 1). Write EVERY. SINGLE. DAY. This is something that helped me move forward and that every single academic coach will tell you to do. Write every single day. I would not let go any of the 30 days of this month (included Saturdays and Sundays) without writing something. A draft note, a series of concepts, a summary of ideas on a particular research project. Transcribe interview data. Create a list of headings for a journal article or a conference manuscript or for a book chapter. 2). Organize your calendar. I knew that this month would be hectic because of whatever non-writing duties I had to perform. So what I did was that I blocked time every single day to write. In my case, it was anywhere between 3:45am and 6:30am. I went to bed early and the first thing I did every morning was wake up, set a pot of coffee and write. Occasionally I would also read my social media streams, but for the most part I would just focus on write. Anybody who knows me knows that I schedule my life to the very last minute, and writing was always on the schedule. 3). Do NOT read your email in the morning. Much less on Monday mornings. Not sure why people tend to answer and send emails on Monday mornings much more frequently than any other day. I noticed this and decided that I will never answer emails first thing in the morning BEFORE writing. If I answer an email in the morning, it’s because I already have written something. 4). Quantify your output. I think the most motivating thing that I have created was my research output documents both for my report on what I did in 2012 and for the projects I am closing with a former student of mine on transboundary water conflict. Just knowing that THAT much work had been done and written keeps motivating me to continue doing stuff. Even if it’s 2 pages, I knew that I had already added 2 new pages to 13 pages of draft notes, etc. Even if just creating one abstract of 300 words, I felt that I had already moved forward. 5). Delegate as much as possible. The mantra I have imbued in my students and research assistants is “I need THIS done. YOU go figure out and do it”. This doesn’t mean that I don’t guide them through data searching and table/figure assembling, but it means that I give them enough freedom to figure out things without me micro-managing them. This attitude of empowering and enabling my students and research assistants frees up my time and brain power to focus on what is important. 6) Devote time every day to READ. Yes, you read right. The strangest thing about academic writing is that, if you don’t read, you can’t identify the gaps in the scholarly literature. By dedicating time every single day to read book chapters, books and articles, I have been able to see where I DON’T want to go in my research trajectory, and where I DO want to go. 7). Take regular breaks. Taking time away from your research is very important. It gives your brain some time to digest concepts and ideas. Despite my long days, I always take some time away. I go for short walks around the CIDE Region Centro campus, or read social media, or go for lunch with my colleagues, or simply take a bus to downtown Aguascalientes and walk around the Zocalo. Furthermore, because I visit my parents every weekend, I dedicate long chunks of time every Saturday and Sunday only to spend time with my parents. Go for a walk, go shopping, visit a new park or museum, etc. If you participated in #AcWriMo, what did YOU learn? Tagged with academic writing, AcWriMo, publications. I learned a lot from #acwrimo too! The biggest lesson for me is that writing doesn’t have to be an isolating experience – I found the hashtag so useful in making contact with other participants, giving and receiving encouragement and advice. I was also reminded of the importance of time management.